How many times have you spent hours searching for that perfect gift for dad, only to end up with another tie? Father’s are hard to buy for, because they don’t like the little cutsie teddy bear or basket of perfume. Father’s, like all men, like the rugged, outdoor, rough and tumble lifestyle that shows they are a MAN. So how do you buy for this type of man? Especially since most of them already have the ‘tools of the trade’ so to speak because they are particular about their equipment? The first thing you need to do is focus on the kind of father you have. Moms, you might want to help the younger ones out on this step. 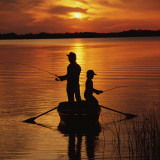 Does he like to fish; does he go boating; does he like to hike; does he like to watch sports on TV; does he play golf; does he…..oh father’s do so many things that they are rarely alike in any way, except of course for one thing--THEY ARE ALL FATHERS. So keep your father’s likes and dislikes in mind, but remember that fathers like things made by their children. The more heart and soul a child puts into a gift the better the father will like it. Will he fall all over it and lavish the child with kisses and hugs? Probably not, most dads don’t do that sissy-girly girl stuff. But their hearts will sing and their eyes will dance with pride and joy at receiving something specifically from their little Prince or Princess. While chosing just the right thing to do, keep in mind that dads do not like dancing (except with mom), going to the beach with a bunch of kids, playing at tea or dolls, and, more than likely, your preferred type of music. Chose his likes, not your own. Put a little effort into the making (or you'll end up with that tie again). Okay, so now we know that kids can give their dads the best gifts. But, does that mean that if they go buy a tie it will be a great gift because the kids gave it to him? No, it doesn’t. You see, anyone can go buy a tie, or a tool, or a golf accessory kit; but not everyone can make a tiny handprint on a t-shirt that is just daddy’s size. Not everyone can paint a picture of the farm (okay so they say it is the farm even though you might not be able to tell), just for dad. Not everyone can write a story that will bring a smile to daddy’s face. The key is make (with their own two hands), not buy! So now, let's get into the nitty-gritty (I know, I'm aging myself) of things that kids, young and old, can do for dads all over the world. Small children can't do a lot or make fancy things so you have to stay simple. Supplies: a white t-shirt in dad’s size; fabric paints of whatever colors dad prefers; a large square of cardboard; waxed paper; paper plate; flat surface. Instructions #1: place the t-shirt on the flat surface, front side up; place the cardboard inside the shirt so that it is directly under the area you want to decorate-use waxed paper on the cardboard to prevent the paint from leaking through; pour paints on paper plates in small amounts and have the child decorate the shirt (you can do front and back but each one needs to be dry completely before you do the next one). Instructions #2: You can also print a favorite picture on regular paper. Coat the paper, picture side up, with a smooth thin layer of plain white glue. Allow it to sit for about 30 seconds, place the glue covered picture down flat on the t-shirt and smooth into place. Allow the glue to dry completely and then, using a damp sponge, moisten the paper and carefully pull it off the shirt. The picture will remain. This shirt will be washable, but the picture will fade with each wash.
Supplies: white paper, crayons, 4 set picture frame (or however many you want), pictures of the child(ren). Instruction #1: Have each child create a picture, even if it is just scribbling, carefully date the picture in a small corner and write (or have the child write) their name (or you can put that info on the back). Instruction #2: Place the drawing into the frame allowing the picture to show in at least one frame (be sure the name and date shows as well). Instruction #3: Put the child’s picture in another part of the frame and use a small piece of tape to attach it to the picture so that it doesn’t fall or slide. Instruction #3: Put the frame back together. Then put the whole thing in the frame. Write up a certificate offering something special. Write up a Certificate offering to spend some time with dad doing one of his favorite things. You could make it plain or fancy and you can even give him a list of choices. The child(ren) can decorate it with their own drawings or things they have cut out of magazines. Frame the certificate for a real treat so that Dad can hang it up in his office or work room after the Big Event. 1} Trace their hand and let them decorate it. 2} Have them use different colors of tissue paper to make a picture-put a drop of glue, tear a small piece of colored tissue paper and stick into the glue. 3} Have them use glitter and glue to swirl color on the paper. 4} Let them use pictures of just about anything to add to the design. 5} Dye sugar or macaroni in a plastic bag with food coloring for additional decorations--place the sugar or macaroni in a large plastic bag. Drop a few drops of food coloring into the bag. Shake and squeeze the bag until the food coloring has been absorbed into the sugar or macaroni. Let them create his card. Let their imaginations run wild. Play with cloth dye for a real unique gift. Tie Dye a white t-shirt using a kit or just wrapping it and rubber banding it in different spots. Once it is dry, have all the kids sign it with love (use a permanent marker)--for added personality you could put the date and occasion on the back or in a small corner like on the pocket. Trace out a heart, or transfer a picture of some sort (see t-shirts #2 above for directions), or just let them sign. eBay can help you get started with this one. ***Have the children bring dad breakfast in bed--of course you might have to make the breakfast, but they can bring the dishes, food, newspaper, drink etc. to him with a tray. ***You could have them wait on him for a meal-be sure to let him know they will be doing it as part of the gift. Of course, there are so many more things that the child(ren) can do for their dad. No matter what they do, if it is done by them, it will mean so much more to Dear Old Dad. Even something as simple as handing him a hand-made card will light-up his heart. Don’t give Dad a tie or something silly for his special occasion; instead, give him something that will be treasured for years to come. He might even keep it to show his grandkids just what wonderful gifts his darling Prince(s) and Princess(es) gave him when they were growing up. Have you ever made something for your dad? Why would I make something, or have the kids make something, when there are so many things out there that you can buy ready-made? Do you have ideas to share? You are welcome, katiem2, glad you stopped by. With the holidays coming up, everyone is wondering where to go shopping for gifts for their boss, co-worker, friend and significant other: Go no further than Zazzle.